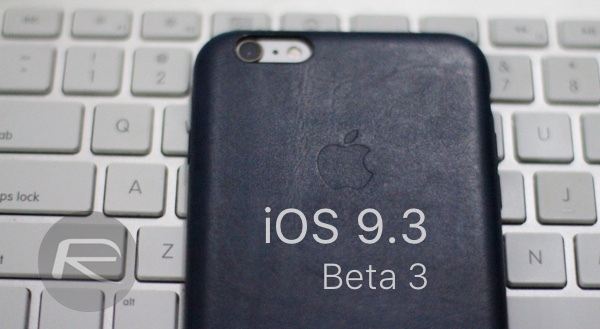 Apple has just starting rolling out iOS 9.3 beta 3 for compatible iPhone, iPad and iPod touch devices to those registered in the company’s Developer Program. This latest release represents Apple’s third release of iOS 9.3, and follows on from the original pre-release version of iOS 9.3 that was initially introduced at the beginning of the year. As you might expect from a third beta of a pre-release version of iOS, beta 3 doesn’t actually introduce any wholesale changes to the iOS experience that we haven’t already seen with the two previous versions. Apple has most likely done a lot of the work feature in this particular release behind the scenes in order to improve the overall stability and experience of the platform across all compatible iPhone, iPad, and iPod touch hardware. There’s also likely to be a security element to the update and generic bug fixes and improvements that make it into any iOS update. A preliminary “quick” look into the seed shows that Apple has made some very minor user-facing changes with beta 3. The world’s most valuable company once again highlights the fact that the release “contains bug fixes and improvements”, but it also looks as though the flagship Night Shift feature has been slightly tweaked when accessing it via Control Center. There’s also a small fix for the icon issues that were previously being experienced in Control Center when in landscape mode, along with added support for Wi-Fi Calling for Verizon users. Of course, if there’s anything else discovered, we’ll update the post accordingly. This particular release continues Apple’s dedication to getting iOS 9.3 into the hands of the public, which will likely happen around the planned media event next month. The initial introduction of iOS 9,3 brought with it the unveiling of the fabulous Night Shift mode that allows the color temperate of the display to be altered at different times of the day. Apple also introduced a number of changes around the native Notes app and how notes can be accessed through Touch ID. iPhone 6s and iPhone 6s Plus users have also gained some additional 3D Touch support in the form of additional Quick Action shortcuts. For a full list of all the major new features in iOS 9.3, check out our post here. Registered developers can access the latest iOS 9.3 beta through the usual Software Update mechanism via the native Settings app directly on the device, or through direct download from Apple’s Developer portal. 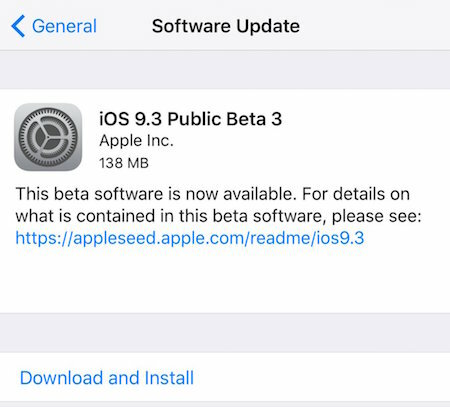 Update x1: iOS 9.3 beta 3 is now available to those registered in Apple’s Public Beta program. Is this the version with the bricking feature added? If not when is that coming? No longer the worlds most valuable company. Google overtook them last week. Wow ok thanks. I gave my brand new ip6 (too small) to my wife and bought a refurb ip6+ and I have no idea what is refurb on it. Knowing my luck it’s the home button but I’m on iOS 9 and ok. Sweet. Dodged a brick for now. Why is article date Feb 11th? Unless it’s a time zone thing. No i bought off our equivalent to eBay in NZ and i can’t imagine this guy using apple to refurb and still make a profit. Phone is fine and i dont care that its not done by apple, but i will if it bricks. For now I’m happy.